Winning and losing is part of the life but taking part and participating the event and playing the game is the most important aspect of life- Techi Kaso. PTC Football Club today lift up the 6th Veteran Cup football tournament in a deciding match with Laba FC here at Rono Ground amid huge gathering of the sports lovers. Addressing the valedictory function Itanagar MLA Techi Kaso said that winning and losing is part of the life but taking part and participating the event and playing the game is the most important aspect of life. The government in state is also giving stress and support for the development of games and sport in state and every one should try to get benefited from it. apart of its own business and occupation one should even play games to remain fit and fine, playing of games and sport help in maintaining a healthy body and sound mind. He appeal all to play games to bring laurel though medal and name and fame. 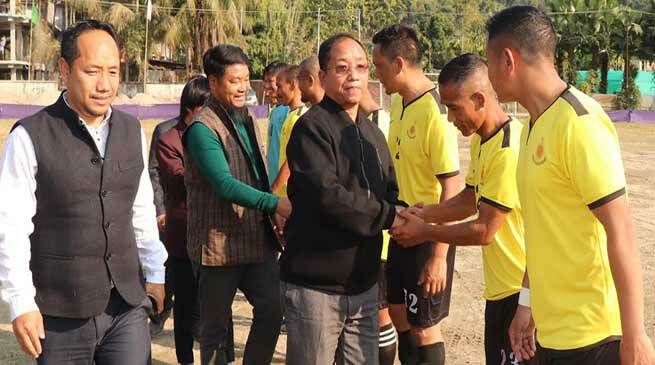 Guest of Honour, Arunachal Chamber of Commerce General Secretary Tarh Nachung also motivated the players and appreciated the organising committee for all success in future. The tournament is being organised by E & K in collaboration with Capital Complex Sporting Club (CCSC) under the aegis of Arunachal Pradesh Football Association (APFA). Organising committee Vice Chairman Tadar Baro, Secretary Tadar Rupu also address the gathering. Tage Tath of PTC declared main of the match and highest scorer, Shan Basutry of Laba FC also declared as highest scorer, Nabam Niya of Laba FC remain best defender, all individuals prizes were also given away with trophy with cash prize. The winner team went away with trophy and a cash prize of 1 lakh and certificate by the dignitaries while the runner up team went away with trophy, certificate and cash prize of Fifty thousand.